Flossing your teeth prior to brushing is among the several ways you can help with your oral health and keeping the teeth clean. By getting rid of debris left over from food, it makes it much easier to keep the teeth and gums cleaner when it comes time to brush. Flossing regularly also helps with preventing the build-up of leftover food particles that result in bad breath. Making sure to floss before brushing is important, but it’s also just as important to make sure that you are flossing correctly so that you get rid of as much plaque and debris as possible without injuring your gums. Always make sure to hold the floss tautly and gently slide it up and down between the teeth below the gum line. Do not snap or force the floss as it may result in bruising your gums and, therefore, bleeding. Remember to use the clean sections of the floss as you go to each tooth. Keep in mind that flossing is much more than simply preventing bad breath and painful mouth conditions like gingivitis. Your teeth play a critical role in the body, from your respiratory to circulatory health. Proper flossing is just one component in your body’s overall well-being. 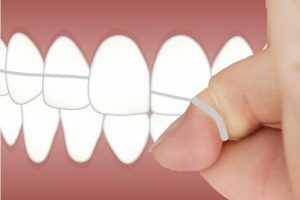 Should you have questions about flossing or if you want to make sure you are doing it correctly, consult your holistic dentist the next time you’re in a for a cleaning or dental appointment. Proper flossing before brushing is essential toward keeping your smile bright and your mouth in good shape.